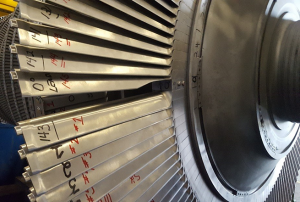 In a forced outage for a customer’s steam turbine, MD&A’s experts at the St. Louis Turbine-Generator Repair facility successfully replaced four rows of buckets (turbine blades) in the HP & LP sections, replaced the thrust collar, and performed other repairs on both the rotating and stationary components. This meticulous inspection, rebuild and installation illustrates how customers can benefit from MD&A’s experts in the field, and at our facilities. The inspection revealed severe damage to the Stage 1A airfoils necessitating replacement of buckets. The Stage3 buckets were also replaced. For both rows, bucket hardware was supplied by MD&A and bucket covers were final machined to restore geometry. In addition, both the L-1 stage & L-0 stage buckets and covers were replaced using material supplied by the customer. 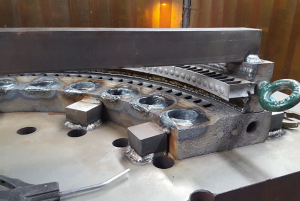 Our experts inspected the customer supplied buckets, confirmed critical criteria were met, provided consultation on a material substitution, performed the necessary activities to ensure properly balanced rows and machined bucket covers to restore geometry. Additional rotor work included supply of a newly manufactured shrunk-on thrust collar and machining of the T1 journal. The overspeed trip was removed and tested by MD&A’s Bearings, Seals & Hydraulics Division. Experts also polished the 11th stage bucket admission edges to remove foreign object debris. Inspection of the stationary components of diaphragms and packing boxes found some with excessive pitting on the packing groove axial steam seal faces. The seal faces were skim cut and custom packing was installed for these diaphragms and packing boxes. New spill strips were installed and machined for these same diaphragms. Several diaphragm horizontal joints were weld repaired and restored to address joint indications and erosion damage. The nozzle bolt hole peening grooves were weld repaired, stress relieved and re-machined. 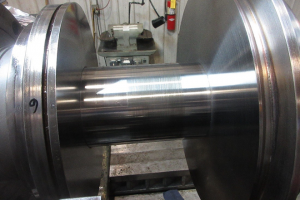 The nozzle admission face was weld repaired, stress relieved and machined to restore axial clearance. Finally, inspection of the Curtis ring discovered it was out of round. The Curtis ring peening grooves and seal grooves were weld repaired and re-machined. The Curtis ring was bolted to the nozzle discharge face and stress relieved after the weld repairs were completed. This re-rounded the Curtis ring to fit into the nozzle tongue and groove fit. The Curtis seals were replaced and machined on-site with a boring bar to restore design specifications. 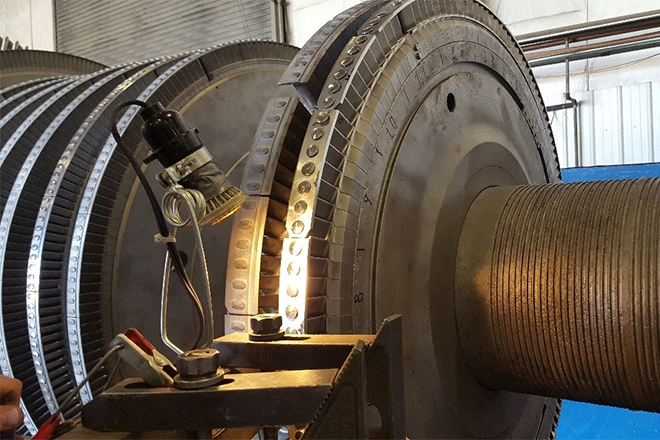 These complex and intricate steps were accomplished in minimal time thanks to the skilled experts at our St. Louis Turbine-Generator Repair facility. Our customer’s turbine was back in use with a short downtime and running again at optimum efficiency. Have MD&A look at your turbine rotor today! Call our Turbine-Generator Repair Facility at (314) 880-3000 or use our Contact form.